When my husband began losing his vision, I spent some time trying to figure out how best to help him. I had been told that I needed to encourage him to be independent; but, at the same time, I was to be available to help whenever he needed. How was I supposed to know the difference? It was a confusing time for me, too! Fortunately, I was able to learn the difference when I attended a session for spouses at the VA vision center in Tucson, Arizona. If you ever have a chance to attend something like this, be sure to go. It was very worthwhile and helpful. For those of you who don't have that opportunity, check out some of the website links below. There is lot of helpful information on the Internet. 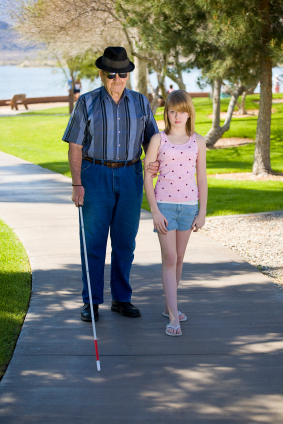 Ways to Assist a Person with Vision Loss. Guide for Family and Friends. Meeting and Greeting a Person with Vision Loss. Contact Tulsa Council of the Blind for more information.